A Boston-based green “investors” group called Ceres, which is backed by prominent anti-fossil fuel activist organizations, has recently published its latest attempt to portray fracking as a threat to water supplies. But despite Ceres’ best efforts, not only does the water used for fracking still account for only a fraction of one percent of the total water used in the United States, it’s also significantly declining. 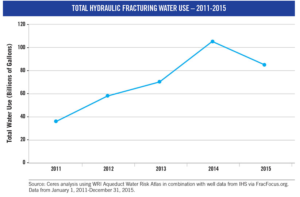 While it is clear that the intent of the update is to show that fracking is a threat to water supplies, a chart included in the release shows a steep decline in water usage since 2014. Of course many will likely point to low commodity prices for the decline, but there is more to the story. Ceres acknowledges that overall water usage is on the decline, but they attempt to save themselves by claiming that “average water use per well doubled.” But in the process they also admit that may be a result of advances in drilling technology that allow for longer wellbores, which in turn, is allowing oil and natural gas developers to drill fewer wells. That means water use overall is going down. Further, another recent report from the University of Texas finds that fracking is actually helping to shield Texas from water shortages because it is allowing the state to move away from using more water intensive energy resources. It’s worth pointing out again that while the Ceres coalition does include some institutional investors – mostly public-employee pension funds – the group also includes a large number of activist groups that actively oppose oil and natural gas development and fracking, a fact you won’t find disclosed in the Ceres report. Many of these members – including the Sierra Club, Friends of the Earth, Natural Resources Defense Council, American Rivers and others — are actively working to ban fracking. Besides these members, Ceres receives financial support from some of the most well-known funders of anti-fracking activism. According a recent annual report, Ceres’ donors include the Park Foundation, the Energy Foundation, the Tides Foundation, and the Rockefeller Brothers Fund. Water usage is an issue that states and energy developers take very seriously. That’s why the oil and natural gas developers are continually innovating solutions to reduce its water use impacts, enhance recycling, and use other non-fresh water sources. Yet, rather than highlight innovations that ultimately provide value to the companies and communities, Ceres cherry-picks their data to construct a false narrative that intends to invoke blame on hydraulic fracturing for America’s water stress in what is little more than a transparent activist-driven campaign to scare investors away from energy holdings.